My 85-year-old mother recently went on a trip and in a small boutique of a visiting town, she found a jacket that she loved and bought for me. When I arrived home yesterday, it was in the mail with a beautiful card - it made me cry :) But when I opened the parcel and pulled out the jacket, I was a bit surprised and to be completely honest, not overly thrilled. It's not my style I don't think - a bit too busy. But the sentiment was beautiful so I knew I would find a way to wear it. It just needed some "Shannon-izing". 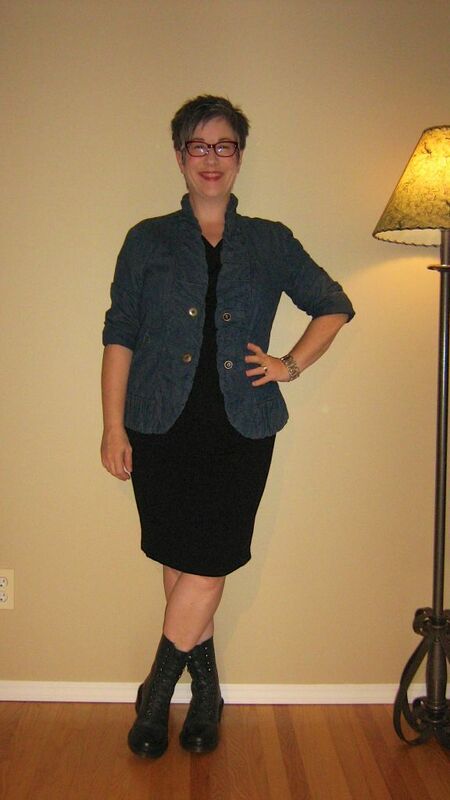 So today's outfit started with my simple black drape front EF dress (I think the CPW on this dress is down to pennies by now) and then topped it with this buttery soft, denim jacket. The jacket has a flattened ruffled placket down the front which goes all the way and around the neckline. It has this same ruffle at the end of the 3/4 sleeves. I do love the soft colour and the feel of the jacket and the fit is fab. Unfortunately there's no label so I can't tell the brand. To give the jacket a bit more of an urban vibe, I rolled the sleeves once to hide the ruffle and scrunched them up a bit. I then chose my black Doc lace up boots to juxtapose the sweetness of the jacket. For accessories, I went with my olive/cobalt snakeskin clutch, a gunmetal and abalone shell bracelet, silver wedding band and red specs. So does this work? Can you tweak an item that isn't really you and that you never would have bought yourself, to become part of your style? As always, all comments/suggestions welcome. I'm crazy in love with everything about this outfit. Now the fact that all pieces are EF don't hurt any. Substituting the bare legs with tights for warmth, could I pull off this outfit with my body shape? I absolutely LOVE IT when Angie posts an ensemble idea and I'm actually able to put together some sort of rendition of it. So today is my version of Angie's toffee, tomato, white and burgundy ensemble. 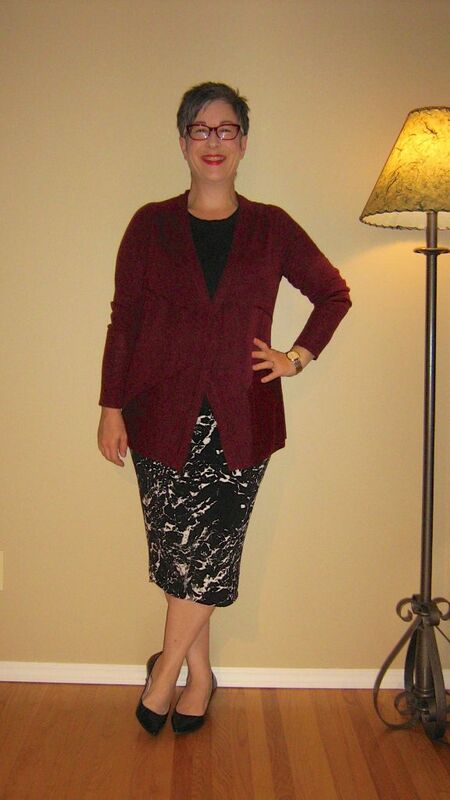 The outfit started with my burgundy skinnies - which unfortunately seem to photograph black. But trust me - they are burgundy. I then grabbed my white mesh sleeve Gap voluminous pull over. This pull over has a LOT of volume and sometimes I find it just too darned bulky, but a semi tuck reins it in a bit. 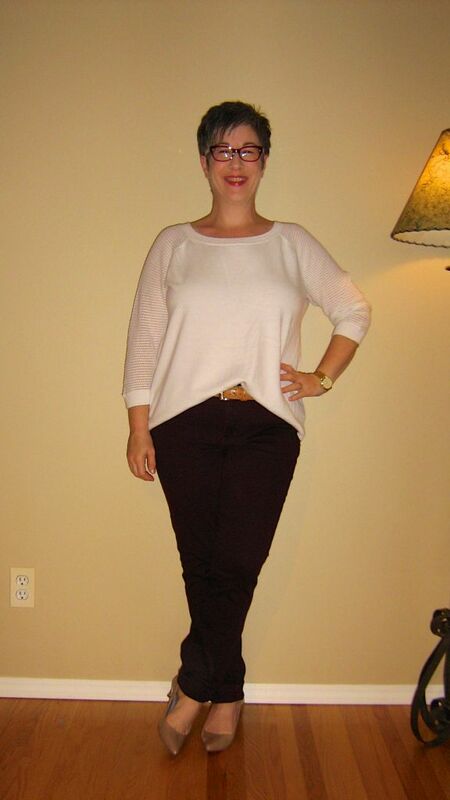 A toffee leather belt and my taupe patent kitten heels finish the indoor part of the outfit. 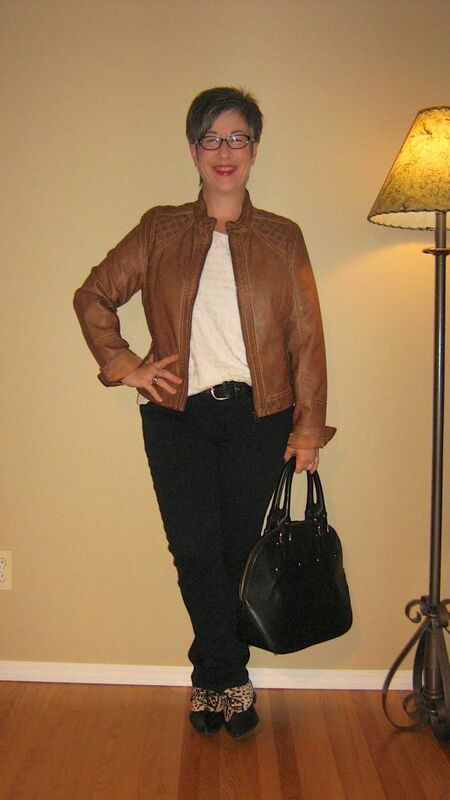 Then for stepping outdoors, I have added my new faux leather jacket in a dark toffee-not-quite-cognac jacket. My red and animal print clutch are the nod to the red portion of the ensemble, as well as my red specs and lip stick. Gold watch and wedding band finish off the outfit. What do you think? Did I pull off Angie's ensemble? I must admit I never would have put these pieces together on my own but really love the mix. Thanks Angie :) All comments/suggestions welcome. 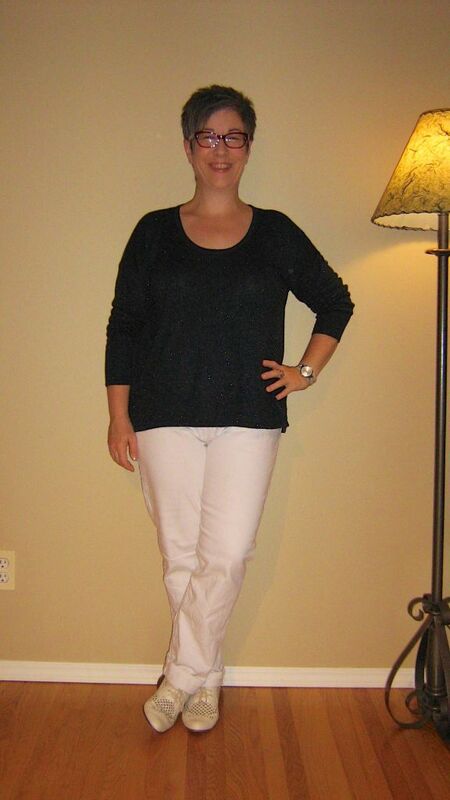 Today I started my outfit with this grey dolman sleeve wedge drape blouse. I wore this on the weekend semi tucked with rolled BF jeans and it works equally well for a work outfit. 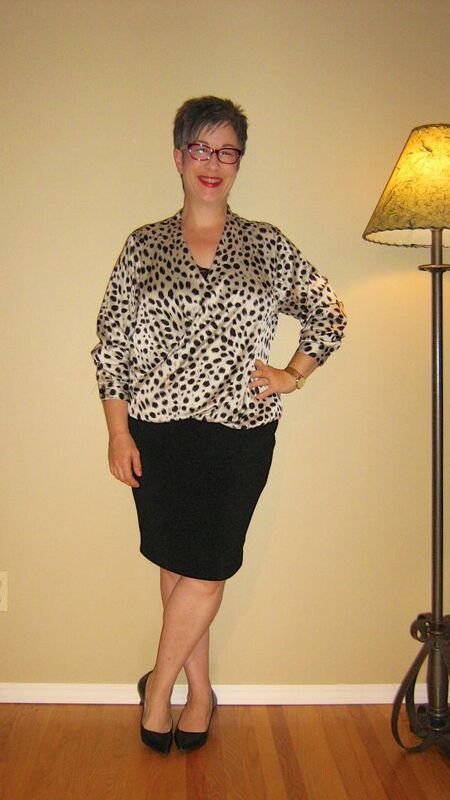 I've paired the blouse with the black pencil skirt from my skirt suit and my black pointy toe kitten heels. These kitten heels have been worn a ton since their purchase and I realize just how versatile a simple pair of pumps are for me - with the lower heel height of course. I wear them with everything from dresses to rolled BF jeans. I finished off the outfit with my 50th birthday silver pendant, silver watch and wedding band, black/white specs and my bright citron clutch. Today's outfit started with my white BF jeans - these TR Brianna jeans have been total workhorses for me and I'm so impressed with the quality. These jeans still look brand new. I paired the jeans with my navy sparkly hi-lo pull over. For some reason I didn't feel like semi tucking the top today and decided to just "let it be". When I head out the door, I'll pop on my navy leather jacket. What do you think? Does it work? Does the top look ok untucked or should I semi tuck to lengthen my leg line? As always, all comments/suggestions welcome. Angie's blog post yesterday about current cardigans hit home for me - I have always been a jacket girl. I love the structure a jacket can give an outfit. I used to dislike that lack of structure that cardigans have - I would feel sloppy in them. But I'm loving some of the current cardigans that have more drape and shape to them. So time to bust out the new EF Dark Tulip asymmetrical cardigan! I started the outfit with my black marble-effect tube skirt and added a simple black knit tank. I would like to find a similar weight knit tank with a v-neck - I feel a search coming on. Over top of that is my new cardigan. I realize that the way the front cuts in it can look like the cardi is done up - but it is open and has movement when you walk. The merino wool blend is oh so soft and comfy. The weather is funny these days - it's quite cool in the morning, freezing in my office, and then quite warm when I come out of work at the end of the day. So although a wool cardigan and bare legs may seem a little bit seasonally confused, that's because the WEATHER is a little bit seasonally confused - lol! For footwear I chose my simple pointy toe kitten heel pumps and for accessories, my gold watch and wedding band, black satchel handbag, red specs and red lipstick. Things have been incredibly busy at work these days - anyone who works in a hospital is probably aware of the HICS structure and I am part of the HICS Ebola Planning. It is exhausting and intense and I have missed you all the last two weeks. Not sure yet when I'll be back more regularly. Anyway - what are your thoughts on the outfit? Does it work? Is anyone else starting to fall in love with cardigans after swearing off them? As always, all comments/suggestions welcome. I may not have time these crazy days to comment on threads but I do pop in and have a look and was absolutely inspired by Carla's black/white/cognac outfit with pointy flats http://youlookfab.com/welookfa.....and-cognac. I knew I had to find a way to copy the elements of this outfit. I'm helping to facilitate in morning huddle today so will be reaching up and bending down to write on flip charts so no skirt like lovely Carla. I chose my black skinnies instead, added my black leather belt and instead of true white, chose my cream lace front tee as my light element. On top of that, I'm debuting my new cognac-caramel faux leather jacket. This is not a colour I would normally wear, especially near my face. But if I wear more flatting colours up top and add a bolder lipstick, I'm ok (at least I think I'm ok?). For my pointy flats, I went with my pony hair/black leather pointy oxfords. Accessories include my black leather handbag, rose gold/black watch, gold wedding ring and black/white specs. A swipe of berry coloured lipstick finishes off the outfit. So does this colour combination work for me? I've partially unzipped the sleeves and turned them up but I think I might zip them again and scrunch instead so my wrist (and my watch) shows). Would love to hear your thoughts, suggestions and critiques of this outfit. 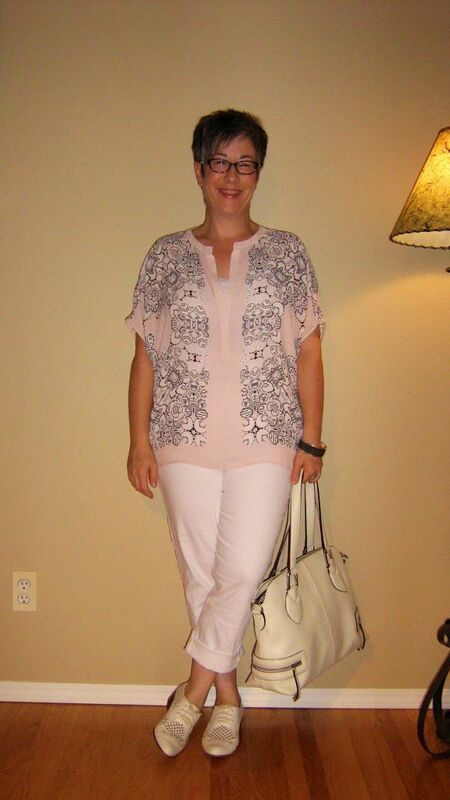 My blush patterned BCBG blouse is one of my favourite purchases from this summer (thank you Angie!) and I'm wanting to extend its wear into autumn 'cause I'm not ready to put it away yet. 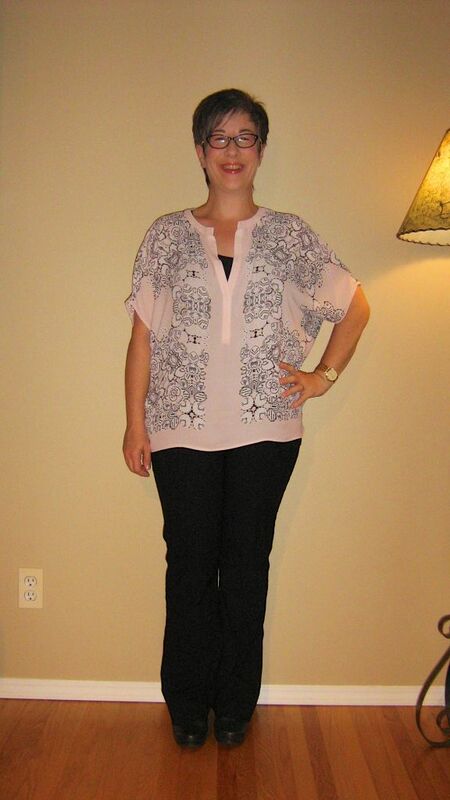 Today I paired the blush kimono-esque blouse with a black tank and black bootcut trousers. I think the full length trousers "autumnize" the blouse but doesn't make it look seasonally confused. For footwear, I went with my metallic charcoal Naot Mary-Jane pumps. These probably aren't the sleekest looking shoe with these trousers but my arches are quite sore this morning so support and comfort are key. On top of everything when I head out the door - and in fact, may keep on in the office depending on the a/c temperature - is my blush leather jacket. I had Danier Leather shorten the sleeves and narrow them slightly over the summer and I much prefer the fit now. The neckline of the blouse and jacket probably compete a bit but that doesn't bother me in the least. To finish off the outfit, I chose my gold watch and wedding ring, black/white specs and my black leather handbag. I like how the hardware in the jacket and handbag are the same gold tone. What do you think? Does the blouse work for autumn? As always, all comments/suggestions welcome.